The trip was to the zoo was awesome, and if you didn’t get to go, I’d definitely recommended you go later on in the semester (perhaps when it’s warmer). 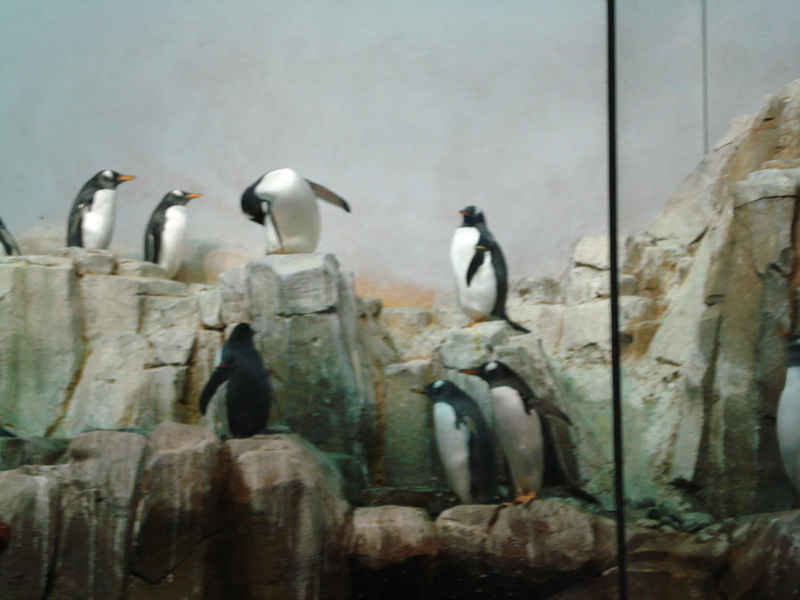 The bird habitats actually reminded me of one of my favorite zoo-like places, the Montréal Biodome. 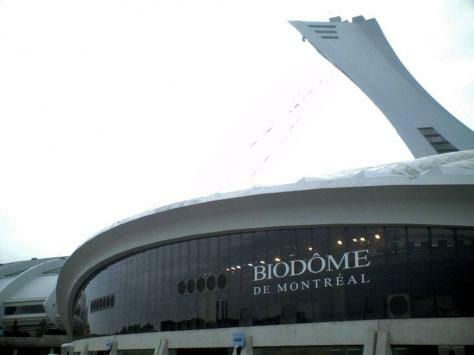 The Montréal Biodome with Stade Olympique hovering behind it. The biodome is divided into four ecosystems with representative plants and animals from each. There’s a Tropical Forest, a Laurentian Forest, a St. Lawrence Estuary and a Antarctic Area. You can walk through these four completely different North American biomes, and the collection is really interesting. Since it’s organized by biome, you get a feel for how the ecosystem looks in the wild, although since the animals are fed I doubt there’s much predator/prey dynamics going on. There are all sorts of creatures in the biodome, and the tickets are relatively cheap (you can get a combination with the Stade Olympique tour for like $25-30 CAD). The Montréal Insectarium and Botanical Gardens are nearby and are really fun as well – you can spend a whole day at the park. If you get a chance to visit Montréal – and you should, it’s only 6 hours away – try to save a nice spring/summer day for this trip. It’s well worth it. Stand-up comedy among Arctic waterfowl. The scientific quality can vary, but the photography and beauty of nature shines through every time. P.S. Microcosmos is not on Netflix as far as I know but has some awesome macro photography of bugs doing their thing and is definitely worth whatever it costs on Amazon. Apologies to those who took ecology last semester, but I love these creatures and refuse to shut up about them. Naked mole-rats (and their closely related cousins, Damaraland mole rats) are the only examples of eusociality in the mammalian world. Eusociality is a level of social organization defined by Wilson as having three features: reproductive division of labor, overlapping generations and cooperative care of young. Although eusocial organization is commonly associated with order Hymentopera, these two mammalian species have been described. Just like bees and ants, naked mole-rats form colonies underground, and most naked mole-rats are non-reproductive workers. There’s one queen who is physically larger and reproductive, while the other mole-rats perform tasks like guarding and digging. The existence of these highly eusocial mammals suggests that kin selection alone cannot explain the evolution of eusociality, as naked-mole rats are not haplodiploid. 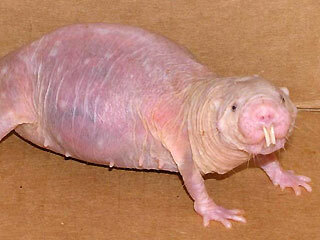 Why would an individual naked mole-rat give up all attempts to reproduce and pass on its own genetic lineage when it’s at very best only 50% related to its brothers and sisters? In fact, the flexibility underlying a seemingly rigid and unforgiving social structure provides clues for its evolution. Based upon observational study, researchers developed a model that suggests that eusociality in the mole-rats came about due to ecological stress, and that such eusociality evoled independently in the Damaraland mole-rats and naked mole-rats. Faulkes et al. measured the genetic relatedness of the many species of mole-rats using 12s rRNA homology, then scored the habitat of each species against factors that could drive the species towards reproductive skew such as aridity and food density. They found that the highest levels of reproductive skew – eusociality – correlated with extreme aridity and paucity of food – essentially, the reproductive success of the individual is increased even if it does not reproduce (after all, some genes are shared between it and its fellow workers) (2). Naked mole-rats also provide evidence for how social organization is regulated neurologically. Species of voles that are solitary or social have different levels of oxytocin receptors in different areas of their brains, and have for a long time been used as model animals for understanding social behavior. Last year, a study was published in the Journal of Comparative Neurology that showed that naked mole-rats show similar patterns of oxytocin receptor sites as social voles – suggesting that oxytocin is a major regulator of social organization in rodents (3). Did I mention that naked mole-rats don’t feel pain (or at least show a normal response to pain agonists like capsaicin) and resist cancer (4,5)? They’re pretty cool animals! Reed has a great website on them if you’re interested (6). Given that their range is limited to Ethiopia and the Horn of Africa, however, they might be a bit too far away to observe this semester. (1) Faulkes, C. G., D. H. Abbot, J. U. M. Jarvis. 1990. Social suppression of ovarian cyclicity in captive and wild colonies of naked mole-rats, Heterocephalus glaber. J. Reprod. Fert. 88:559-568. (2) Faulkes, C. G., N. C. Bennett, M. W. Bruford, H. P. O’Brien, G. H. Aguilar and J. U. M. Jarvis. 1997. Ecological constraints drive social evolution in the African mole-rats. Proc. R. Soc. B 246:1619-1627. Mole-Rats and Solitary Cape Mole-Rats. J. Comp. Neurol. 518:1792-1813. Everyone is posting pictures of their pets and since I love dogs, I believe I will do the same. This isn’t technically MY dog, but she’s close to me all the same, and I believe, a model organism for the study of animal behavior. 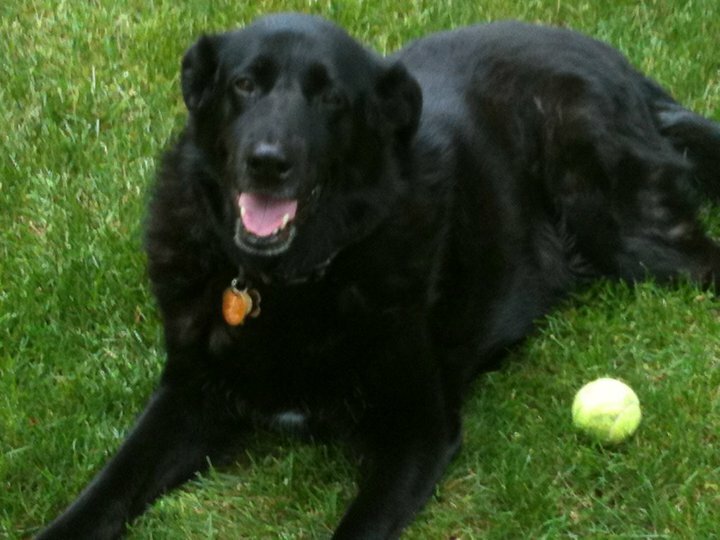 This subject appears to be pleased with itself after retrieving a tennis ball. Fixed-action pattern, perhaps? While touching on the idea of fixed action patterns in class today, we were searching for examples of such actions in humans. I thought that the mammalian diving reflex is quite an interesting example. Upon submersion into cold water (the temperature of the water modulates the effect), the mammalian body slows respiration and decreases heart rate, then shuts off blood circulation to the extremities in order to conserve oxygen. This instinct helps explain why certain mammals such as seals are able to dive for extended periods of time without resurfacing; for humans, the reflex is weakened but present. Interestingly enough, the face must be submerged in water to activate the reflex – dipping the limbs into water will not. It’s a pretty cool system, in my opinion, and it apparently also explains why hypothermic individuals can survive without oxygen for longer periods of time. Anyway, that’s the idea I had for my first post. If anyone wants to know more, I included the websites I looked up (yay wikipedia). I’m looking forward to seeing other people’s posts!